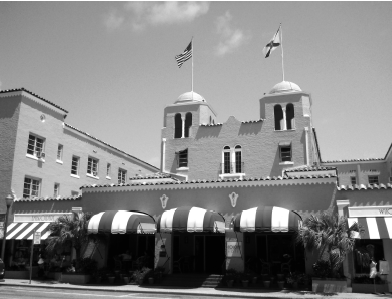 The Colony Hotel and Cabaña Club is not the Biltmore, but it is a really spectacular hotel. The three of us—Joanne, Sue, and I—had spent most of the previous day and evening exploring the Biltmore and talking to people there. We were tired, but the following morning we got an early start and drove the 50 miles north to Delray Beach, just above Boca Raton. Like the Biltmore, the Colony, sister hotel to the Colony in Kennebunkport, Maine, was built in 1926 by the father-and-son team of Charles and George Bowden, to cater to the hordes of well-to-do Northerners who flocked to Florida to escape the cold, snowy winters and bask in the sunshine and leisurely Florida lifestyle. For many years, the hotel was closed during summer months, when the entire staff moved to its sister hotel in Kennebunkport. Furniture was covered with sheets. All but a few lights and all other nonessential electricity were turned off. Cobwebs and dust collected in corners, windowsills, furniture, and floors. A caretaker was left behind to perform minimal maintenance on the grounds, cutting grass, watering plants, and providing some security. But in summer, even with a caretaker around, the Colony looked mostly abandoned, forlorn, and even ghostly. 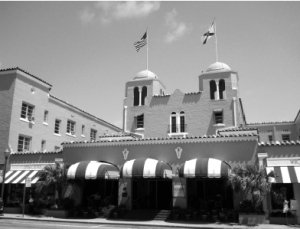 Perhaps because the hotel was closed much of the year and for so many years, rumors of strange happenings grew about the place, including tales of mysterious lights, sightings of apparitions, and unexplained sounds emanating from the building. Maybe they were true or maybe they were just the imaginings of strollers passing by in the dark. In any case, the Colony developed a reputation for being haunted. One summer evening during the off-season, a couple was walking down the street past the empty hotel and saw, or thought they saw, movement inside. The figures they saw seemed to be running back and forth in the darkened building. They thought perhaps kids had broken into the place and were robbing or ransacking it. This was in the days before cell phones, so they crossed the street to a gas station and called the police, who quickly responded. Several squad cars arrived, and officers walked around the exterior to check for signs of a break-in. There were none, so they contacted the caretaker to get permission to enter. Inside, a quick check revealed that all the doors were locked and the alarm system was functioning properly. It had not been tampered with. One officer was standing in the lobby when suddenly the elevator started rumbling as if it were moving. Then it stopped and chimed, the usual signal indicating that it had arrived at the desired floor. The doors opened, but no one came out. The officer stood there watching, dumbstruck. Now quite nervous, he radioed his partner, who joined him in the lobby. Together they finished their investigation and left, the caretaker locking up and resetting the alarm behind them. They had found nothing out of order. During the same period, passersby began reporting orbs, or balls of light, flying erratically in front of second-story windows. These orbs became quite common for several months, and many people reported seeing them. Then, as suddenly as they had begun appearing, they disappeared. None have been reported since 1989. In 1999 the hotel began staying open year-round, and the stories of paranormal activity have persisted. Guests have reported strange lights and dark figures moving through the hotel, and some have heard music coming from the darkened and empty dining room. The music can be heard only on moonless nights and early in the morning, before 3 a.m. And some have heard female voices coming from the dining room, when no one was there. One staff member reported that on several occasions he has heard noises from the empty kitchen: pots clanging, utensils being dropped, an occasional plate shattering on the floor. He said that, each time, he has gone in to see what was going on, half expecting to find a mess. What he found was a kitchen in perfect order, pots hanging and dishes stacked where they should be. Justina Broughton, Charles Bowden’s granddaughter, has reported hearing animated discussions coming from the office and the kitchen. When she was a child during the off-season, she would often accompany her father into the closed hotel and run through the halls and empty rooms. She recalls that she often caught fleeting glimpses of something or someone out of the corner of her eye and thought nothing of it at the time. And more than once she saw an older, well-dressed man reflected in the glass cover of a painting. She had the odd sensation that he was her grandfather, and well he may have been. In any case, her experiences were always benign, even pleasant. We were welcomed by a friendly staff. Although most of the people we talked to were a bit reluctant to discuss the paranormal activity there, they allowed us to roam around and take a look for ourselves. As we walked around, Joanne was able to confirm many of the stories we had heard from others or read about. She saw dark, fleeting figures in the dining room and hallways and heard the clanging of pots and pans coming from the kitchen, as well as music and muffled voices in the dining room. She didn’t find anything peculiar about the elevator but did sense activity on the second floor. Mostly, she confirmed what we already knew. We couldn’t stay very late, so we were not able to experience anything that might be taking place in the wee hours, but I have no doubt of their veracity. As we left the Colony, I promised Sue I’d bring her back for a long weekend. It seemed a wonderful, romantic place for a getaway. 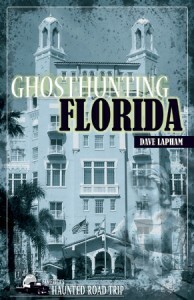 In his book Ghosthunting Florida, Author David Lapham visits more than 30 legendary haunted places in the Sunshine State.